The Winnipeg Jets meet their first of two Canadian opponents for the first time when they begin a two-game, two-day road trip to play the Toronto Maple Leafs and Ottawa Senators Wednesday and Thursday night. For the 1-3 Jets, they will have a tough opponent in the 3-0-1 Leafs, who dropped their first game of the year in overtime to the Colorado Avalanche on Monday night 3-2. Phil Kessel will always be one to watch as he is off to a hot start with six goals and three assists for nine points in four games. The Leafs have three players with five or more points, with captain Dion Phaneuf collecting one goal and four assists through four games and Joffrey Lupul picking up two goals and three assist through four games. As always, James Reimer will be in net for the Leafs. Reimer, a Manitoba native, has a 2.49 goals against average and a sparkling .917 save percentage through four games, including a home opener shutout of the Montreal Canadiens. Alexander Burmistrov leads the Jets in points with three assists in four games, while Ondrej Pavelec bettered his stats last game to a 3.37 goals against average. 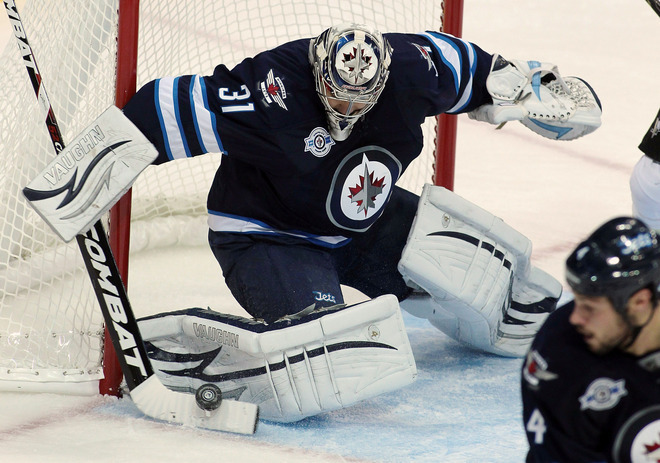 The Jets have yet to win a game on the road, having lost their last two to Chicago 4-3 and Phoenix 4-1. Tonight's game is the only game in the NHL and game time is 6:30 PM CT and is available nationally on TSN as well as on TSN-Jets and RIS(HD). It is available on the radio on Sports Radio 1290 in Winnipeg.